With the election of John F. Kennedy in 1960 and the close of the Second Vatican Council in 1965, Catholics finally became fully American. Or so we’ve been told. This triumph occluded other Catholics, though. Non-white Catholics were not included in this vision of “American Catholicism.” On April 16, 1968, Black Catholics gathered in Detroit and declared the Catholic Church in the United States a “white racist institution.” In commemoration of the 50th anniversary of the National Black Catholic Clergy Caucus, Matthew J. Cressler will argue that centering the stories of Black Catholics requires us to reimagine our histories of American Catholicism. 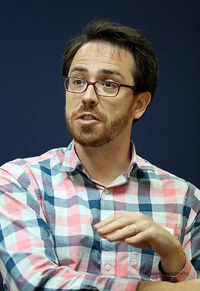 Cressler is assistant professor of religious studies at the College of Charleston in South Carolina, where he teaches courses on African American religion and religion and race in the United States. He is the author of Authentically Black and Truly Catholic: The Rise of Black Catholicism in the Great Migration (NYU Press, November 2017). He is at work on an article manuscript titled “Categorizing Catholic Racism,” which focuses on White Catholic resistance to desegregation in the 1960s, ’70s, and ’80s. Feature photo: Rev. Herman A. Porter (right) convened the 1968 meeting out of which the National Black Catholic Clergy Caucus was founded, electing Rev. Rollins Lambert (left) as caucus president. Sister Martin de Porres Grey, R.S.M. (center) was the only woman religious to attend the meeting, and later that year would found and serve as first president of the National Black Sisters Conference.